Trevor went to the pull-a-part today for mufflers. It was pretty evident to us even before the CB750 motor was running that the straight pipes weren't going to make it past the 95dB@50ft@WOT noise restriction. 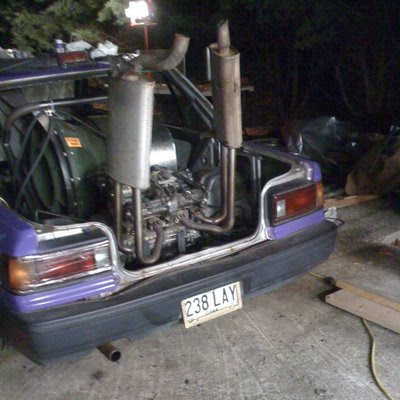 It seemed a shame, as the pipes looked pretty awesome sticking out of the back of the Civic. What he came back with was mostly rust. One of the mufflers had been packed full of acorns by an enterprising chipmunk. I was initially dissappointed with Trevors haul, as the mufflers seemed too heavy to put one each onto the pipes, but Trevor and Nick managed to turn it into a work of art.